Successful sales teams treat sales as a science, backing out the exact number of prospecting activities, meetings, and proposals they need in order to hit their quota. The key is starting with a healthy pipeline and optimizing conversions from stage to stage of the sales cycle. So, how good is your sales team at driving deals to close? It’s common practice for sales reps to go through the motions of doing their template emails, basic BANT questioning, and using discounts to close. What sales reps need to do is elevate the game and get more analytical with their approach. Sales is as much a science, as well as art; weighing the foundation of the art form. When you go into a meeting, fully prepared with questions and having done your research (checked out their LinkedIn profile, company website, etc. ); then going into another meeting having nothing ready – which one goes better? It’s the science – the analytical approach – that puts your foundational pieces in place so the art form can be that much more effective. Finding a balance between the art and science will help you take control of the sales process and ultimately close. As a part of your prospecting activities, you’ve got your inbound calls, outbound calls, and emails. 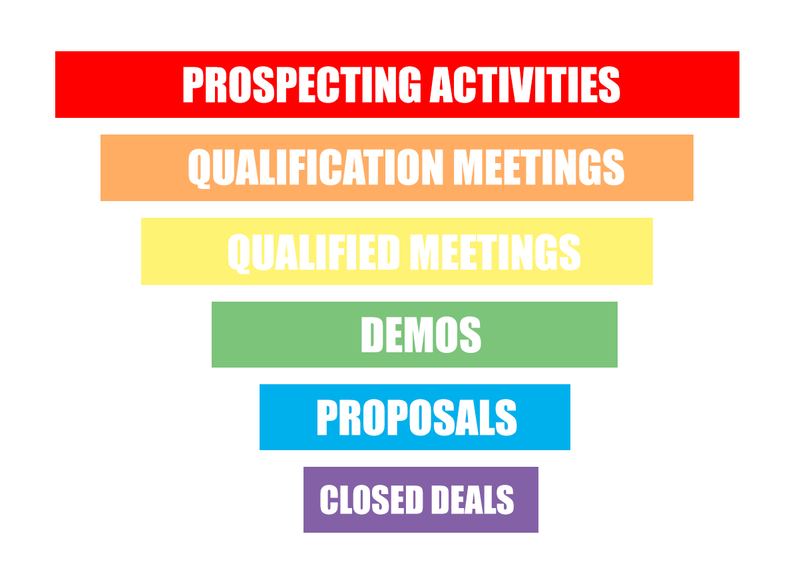 You realize you need to accomplish a number of prospecting activities before any qualification meetings are made. Next, you have your handful of qualified meetings in hour long sit-downs, maybe a few demos, possibly a proposal, and finally – the holy grail of holy grails, a closed deal. You like the end result. So, how did you get here? Let’s say your average revenue target is a million dollars, but your average deal size is $52,000. Take a step back and think, “What are my conversion ratios between the major stages of the sales process?” Take a look at your numbers from the previous month. For every phone call you made, how many of those have turned into a conversation with someone? Maybe 15%. How many qualification meetings turned into legit, qualified meetings? 20%. Okay, now you’ve got your baseline numbers of the calls made versus meetings booked. This equation pulls out the number of activities you should be doing on a daily, weekly, monthly basis to be able to hit your target. When you’re more scientific about your sales approach, you get more effective and closer to hitting your quotas. Rather than starting your quarter and just stating your goal, calculate it. The equation helps forecast end results, but it’s the metrics and actions you take within the equation that affect the actual result. You now have very specific targets on a daily, weekly, monthly basis, so you begin to tweak your activities and see if you might increase your conversion ratios. Say you’re doing spectacular in stage 1 and 2 of the sales process, flying through your prospecting activities and booking qualification meetings left and right; but you’re having a hard time in getting qualified meetings. This is your area of focus. There are certain steps in those stages that are absolutely critical in leading to a closed deal. Realize which activities are making the biggest difference to tweak your conversion rates. When you focus on improving your problem areas, you’ll start seeing better results. People are often good at measuring and tracking the end result, but have difficulty understanding the equation and breaking it down to activities and levels. When you break your target into smaller goals to achieve, your target seems infinitesimally more achievable as you constantly reach your goals. Think about the expectations you want out of a salesperson on a daily, weekly, monthly basis; then think about the metrics that are going to have the biggest impact. Focus on the activities and core metrics that really drive your business; and celebrate your reps for these smaller milestones. When you celebrate more than just the end result, your reps will be more motivated along the way with the recognition they deserve. Negotiation starts the minute you interact with somebody. Based off a quid pro quo, you have your “gives” and your “gets” to come to a mutual agreement and a win-win situation. To be prepared for a negotiation, brainstorm a list of what you want to get from this meeting and what you’re expecting (and willing) to give. You don’t want to talk to just anybody, you want a champion. With a give and get list, you can create a champion client who’s going to get you the information and people you need to close the deal. In negotiations with clients, gives and gets are either an exchange of information, requests for discounts, or extensions on trials. So when a client asks for information, don’t be afraid to ask for something back. Respond with, “Thrilled to send you more information. What information would you like to see? When would you like to schedule a 15-minute call so we can follow up on this information and see if it makes sense to take the next steps?” And while you’re on the call, don’t be afraid to ask them right then and there to look at their calendar to pick a time. It’s best to get a slot on their calendar and let them know if necessary, the meeting can be rescheduled later. Lock it in – it’s much easier on the phone than playing chase the following week. It’s important to keep the flow of giving and getting balanced in your negotiation. Employ the Rule of Reciprocity to build relationships and connections with your clients. However, if you’re in a situation where one is constantly giving and the other is constantly getting, the outcome will likely result in the client disappearing. Clients can get used to getting, and don’t feel the need to ever give. It’s easier to give back right after a get, instead of constantly giving and expecting a huge return. The sales process is a science as well as an art. When you take the salesperson out of the equation, you just have marketing automation. Your salesperson has their psyche, motivations, and relationships. When you add that to the science of sales, it becomes very powerful. Part of the science is knowing your equation and the metrics that drive your business. Think about the number of calls you need to make, the opportunities you need to create, and how that equates to your win rate. These critical metrics are your key selling activities. When you get more objective with your sales process, you can learn more and improve on your activities. By focusing on smaller goals that lead to your target, reps can get incrementally better on a daily basis.